Installing a salt chlorinator is definately worth the expense. Salt is a natural flocculant which means that your water clarity is far superior to a pool using chlorine. Salt also makes the water softer which makes your swimming experience a pleasure. 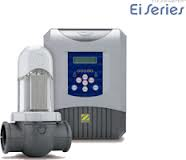 Salt chlorinators also allows the user to adjust the chlorine output to ensure optimal operation. There are two types available - the self clean models which require little to no maintenance as well as the standard models that require weekly cleaning of the electrode. We make use of two types of salt chlorinators - an imported model as well as a locally produced model.